If you are like most, you have probably heard about thyroid testing and hormone testing but still aren’t entirely sure exactly what this entails. In today’s blog, we at Springs Integrated Health are going to help shine some light on this subject. As Colorado Springs’ top holistic medical center, we strive to help the people of Colorado Springs live fuller, healthier lives. We achieve this through the integration of holistic services like chiropractic care, physical therapy, trigger point therapy, deep tissue laser therapy, and medical and diagnostic services, which include hormone and thyroid testing. Learn more about our services here and contact us today to schedule your appointment. Simply put, hormone testing is a way of measuring and monitoring a body’s hormone levels. In many ways, our hormones are like instruments in an orchestra. When all of the instruments are balanced and in sync, they can play perfectly in unison. However, when one is out of tune, it can ruin the melody and affect the entire concert. To prevent this disturbance from happening, it is important to be on the lookout for the signs of a hormone imbalance, get a hormone test, and take measures to treat any issues. There are a variety of hormone tests, including saliva testing, serum or blood testing, and follicle stimulating hormone testing. To find which testing method best suits your needs, consult with your physician or contact Springs Integrated Health to set up an appointment. Located just below your voice box and in front of your windpipe, the thyroid gland makes and stores hormones that affect nearly every organ in the body, including the development of the brain. By using iodine from food, the gland makes two key hormones—thyroxine (T4) and triiodothyronine (T3). These hormones are not only essential to brain development when young, but adults also need these hormones to properly regulate metabolism and energy usage. When Are Thyroid Hormone Tests Performed? 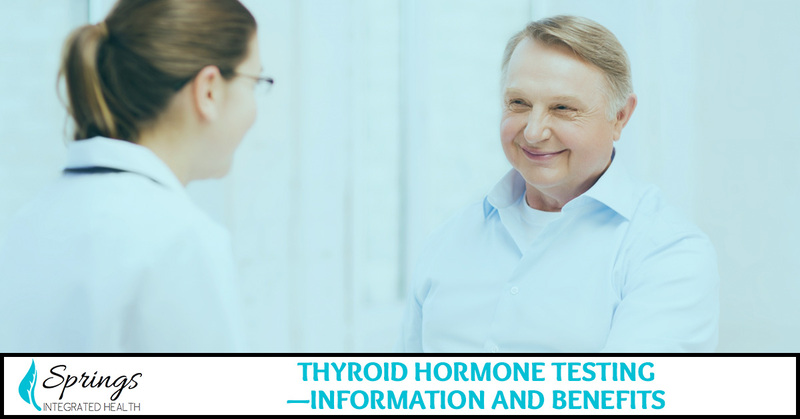 Depending on your symptoms and suspected type of thyroid problem, your specialist may request to have one of the following lab tests performed—TSH, Free T4, Free T3, Reverse T3, Thyroid Peroxidase Antibodies (TPOAb), and Thyroglobulin Antibodies (TgAb). Thyroid tests are done by simply using a blood sample. The sample is taken from a vein in your arm, and there is little to no risk of encountering a problem—apart from the chance of having a small bruise on your arm. If you take blood-thinning medication or suffer from a bleeding disorder, do inform your doctor before they conduct the test. Are There Ways To Improve Thyroid Function? Though the symptoms of a thyroid imbalance can be vague and, therefore, hard to diagnose, there are a number of ways to improve the function of your thyroid gland. It is estimated that upwards of 25 million Americans have a thyroid problem, and what’s worse is that over half are unaware of their condition. No one should have to live with an untreated hormone problem, because if your thyroid is not performing optimally then neither are you. If you would like to schedule an appointment to receive a thyroid blood test, contact Springs Integrated Health today. We are Colorado Springs’ trusted source for holistic medical care, and our medical and diagnostic services team strives to pinpoint the cause of your symptoms and develop an individualized healing plan. Call us to schedule your free health assessment and consultation now!